Collaboration between managers and researchers is a key element for improving the understanding and management of ecosystems, and especially in temporary rivers due to their lack of recognition by society. 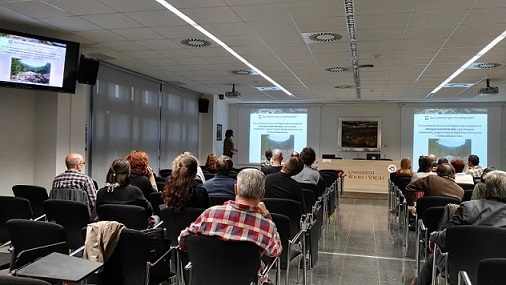 The relationship between the TRiversproject and Els Ports Natural Park is an example of this interaction, as shown during the Outreach workshop organized on November 15th by Els Ports Natural Park in Tortosa (Catalonia). 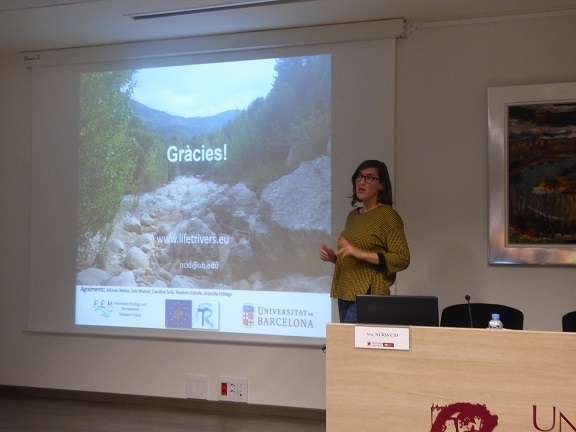 Núria Cid, researcher from the Department of Evolutionary Biology, Ecology and Environmental Sciences of the UB and member of Life TRivers presented the results of the project, focusing on those rivers located in Els Ports. The headwaters of the Canaletes and Algars rivers, both located in the Els Ports Natural Park, and the Cérvol river, at the Tinença de Benifassà Natural Park, are studied by TRivers because of their good conservation status. Thus, in these systems biological communities of permanent and temporary rivers can be compared without the influence of human impacts and be used as reference. As a result of this research, Núria Cid highlighted the importance of adapting the sampling calendar and sampling location in naturally temporary streams and use current sampling methods only in that period with the highest chance to find the river in flowing conditions and when all the habitats are still connected. This situation can be detected using the TREHS software, developed by the TRivers project. The software uses different information sources, such as measured water discharge from gauging stations, simulated flow data, interviews with locals and aerial photographs. Regarding ephemeral streams, Núria Cid proposed the development of alternative methods. The study also included reaches of permanent rivers that become temporary due to hydrological impacts such as water abstraction. These rivers correspond to the lower Matarraña river, and the Sénia river. For example, in the Matarraña, only isolated pools are left during summer, affecting populations of many aquatic organisms such as native fishes, most of them threatened. According to the presented results, biological quality in these rivers decreased mainly due to the hydrological impact. Therefore, it is highly relevant detecting the current hydrological impacts to establish ecological flows. Only with this effort we will be able to maintain the biological quality of rivers following the EU Water Framework Directive and conserving the high freshwater biodiversity hold by Mediterranean streams and rivers. During the workshop, related studies were presented. For example, the results from the dragonfly and damselfly monitoring program conducted in Els Ports Natural Park by Pere Luque, biologist at the Terres de l’Ebre Museum. It was discussed whether populations of the dragonfly Macromia splendens, a protected species that needs permanent rivers to complete its life cycle, could be negatively affected by flow reduction in the near future due to present and planned water abstraction and/or climate change.